The Magellanic Clouds (yellow bead) are suspected of producing the warp observed in the hydrogen gas layer of the Milky Way as they make their looped orbit through dark matter. Washington,DC--A slow-motion collision between mysterious dark matter and two of the MilkyWay's galactic neighbors may be causing our galaxy to warp like a vinyl recordleft out in the hot Sun, scientists announced today. Astronomershave puzzled over the Milky Way's warped shape for nearly half a century buthave been unable to provide a convincing explanation for what might be causingit. The warp ismost clearly visible in a thin disk of hydrogen gas that extends across theentire 200,000-light-year diameter of the Milky Way. Viewedsideways, one half of the hydrogen disk appears to stick up above our galaxy'splane of stars and gas, while the other half dips below the plane for a bit andthen rises upward again farther away from the galaxy's center. One earlyexplanation was that the gravity from two neighboring dwarf galaxies known asthe MagellanicClouds was causing the Milky Way to warp as the pair moved in their1.5-billion-year orbit around our galaxy. Thishypothesis was later dismissed after it was shown that the combined mass of thetwo dwarf galaxies is only about 2 percent of the Milky Way's enormous hydrogendisk--not nearly enough to cause the warp. Nowresearchers from the University of California, Berkeley have revived this oldtheory but with a new twist. Usingcomputer models, the team showed that the Magellanic Clouds could warpthe shape of the Milky Way, but only if they were moving through a thick haloof hypothetical darkmatter. Dark mattercan't be directly observed because it neither emits nor reflects visible lightor other electromagnetic radiation. However, its presence has been inferredfrom the gravitational effect it has on visible matter such as stars andgalaxies. Astronomers believe that dark matter may make up as much as 90percent of the mass in the universe. 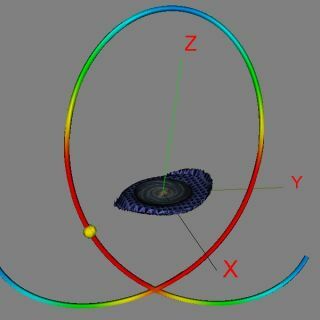 Thecomputer model suggests that if the dwarf galaxies were moving through darkmatter, then their gravitational influence would be enhanced to the point wherethey could cause warping similar to what has been observed. The modelalso revealed another surprise. "We oftenthink of the warp as being static, but this simulation shows that it is verydynamic," said Leo Blitz, an astronomer from UC Berkeley who was involved inthe study. The modelindicates that as the Magellanic Clouds interact with dark matter, they createvibrations that cause the Milky Way's hydrogen disk to oscillate. The overalleffect is reminiscent of the edges of a tablecloth flapping in the wind, theresearchers said. Since manyother galaxies are also warped, the researchers believe similar processes mightexplain their shapes as well. The studywas detailed here in a press conference at the 207th Meeting of theAmerican Astronomical Society and will be published in an upcoming issue of theAstrophysical Journal.